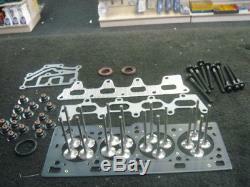 1 X NEW HEAD GASKET SET INCLUDES EXHAUST INLET GASKETS, CAM SEALS, VVC SEAL AND BREATHER GASKET. 1 X NEW HEAD BOLT SET. 8 X NEW INLET VALVES. 8 X NEW EXHAUST VALVE. ENG CODE F4R RENAULT CLIO SPORT 172 182 2.0 16V MODLES WITH ENGINE CODE F4R. The item "RENAULT CLIO 172 182 2.0 SPORT 16V HEAD GASKET SET 16 VALVES HEAD BOLT KIT" is in sale since Thursday, July 6, 2017. This item is in the category "Vehicle Parts & Accessories\Car Parts\Engines & Engine Parts\Gaskets & Seals".